As you may know from previous blogs, one of the questions I am most frequently asked is my favourite room at Highclere. I can never quite make up my mind so my answer is not always the same. Sometimes I veer in favour of the top of the Tower for the extraordinary views of the Castle looking down onto the surrounding cedar trees and into different landscapes; another answer might be the cosiness of my untidy study with books piled everywhere (it is Geordie’s too but the mess is mine). An alternative is the peace of having a bath in a huge Victorian enamel bath with masses of hot water and relaxing oils in a high-ceilinged room in a corner tower.Forgetting about the day, my mind wanders and every so often returns with “a bright idea”. The key to bright ideas is to discuss them and to remember that I have two ears, two eyes and one mouth. Thus I should listen, and observe reactions, roughly in the proportion of 5:1, rather than plough on regardless. One bright idea came from contemplating (in my bath) the books in the Library. 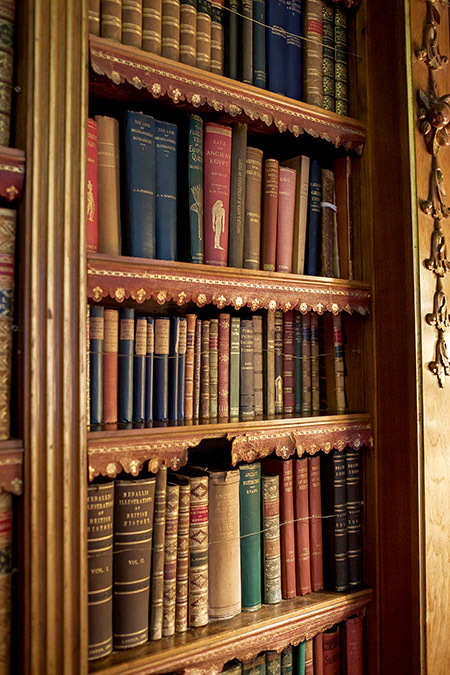 Highclere’s Library has about 6,500 books. They have been collected over the centuries, handled, read and absorbed. Even now I might well open a few pages in appreciation of the beauty of the book itself. Sadly, in today’s world, reading has to compete with so many other mediums. Inspiration to read and from reading however can compliment TV programmes and films. Stories and characters step into our lives on the screen. I’ve watched actors from Downton Abbey practising their lines whilst walking up and down the Castle and how, from that, they became “real” fictional people with whom viewers fell in love, discussed over supper and re-watched. Thus, in this way, the idea of a week of events entitled “From Script to Screen” tripped out of the bath and headed towards the website. The bright idea became words on a web page. Bubbling away to my husband about my wonderful alliterative skills, he rather more prosaically asks me who is actually speaking? That particular line of “script” resounded with me as Lauren (from our office team) and I set off to gather some wonderful speakers. I was very lucky and by chance, at a literary festival I sat down next to a fascinating lady with a wonderful story: Shrabani Basu. I had already seen and thoroughly enjoyed the film “Victoria and Abdul”, after all who does not love Judi Dench? Other speakers include Andrew Davies, with a myriad film and TV productions under his belt, and Paula Byrne, celebrated for her work on Jane Austen and the film “Belle” The hit TV series Poldark became de rigeur Sunday evening viewing after Downton Abbey ended. Caroline Lowsley Williams, whose family own Chavenage where part of it was filmed, will be taking us behind the scenes as she welcomed the crew and actors such Aidan Turner, Heida Reed and Eleanor Tomlinson. Location manager Sue Quinn worked on all the Harry Potter movies. I met her when a few minutes of “The Legend of Tarzan” was filmed here. On the Saturday Kit Hesketh Harvey will share his talent for words and music before amusing us all in the evening, whilst on Sunday Anne Diamond, who remains one of UK television’s most famous faces, will share her current project in turning a book into TV. Thus thoughts in the bath have become a week in which to share ideas, books, scripts and TV: a chance to sit down, listen and talk. I always like a good quote and Shakespeare can be relied on to sum it up: “Words without thoughts never to heaven go”. Sinking into a long bath in a lovely home is a bit of heaven and it is amazing what it can produce! I agree that “soaking” in the tub can result in many wonderful ideas. Well done! You have organized a fascinating sequence of events, the sum of which Shakespeare would be pleased. Enjoy the week! Words lifted by thought take flight as adventure. This one sounds magical. I watch Downton Abbey regularly, But I am having a problem trying to find the answer to why, Carson, the Butler, filters the wine through a napkin before serving it. If, and I am sure you do know the answer, please send me a reply . Aahhhh…. two of my absolute favorite past-times… relaxing in a wonderful bubble bath with lit candles burning and soft music playing AND reading a good book! You are so right that reading has become something less than it used to be because of all the other technologies jockeying for position. I’m currently taking a long break, possibly a permanent one, from Facebook (it’s amazing how much valuable time can be wasted on Facebook) and as a result, have been reading lots and lots of good books. What a joy! It’s almost like riding a bike again, the forgotten joy and love of a childhood activity sprung new again. My next goal is to read all the classics I either missed while growing up or have read and never retained. Thank you for your wonderful blog posts. They are inspiring and always informative. Yes you are right I forgot that I turn the radio on as well – must just confirm I do NOT take books from the Library into bath!! Thank you for that statement about Facebook! I, too, have that feeling occasionally! The photos of your baths are beautiful! Thank you for sharing your insights and thoughts! We discovered Poldark last year and are completely smitten! Wish we could be there on May 23rd, please be sure to tell us all about it! Will do – Caroline -whose house it is – is with on the Friday. She is such fun and we will all enjoy her tales! Oh, and what lovely bathtubs to soak in and be inspired! 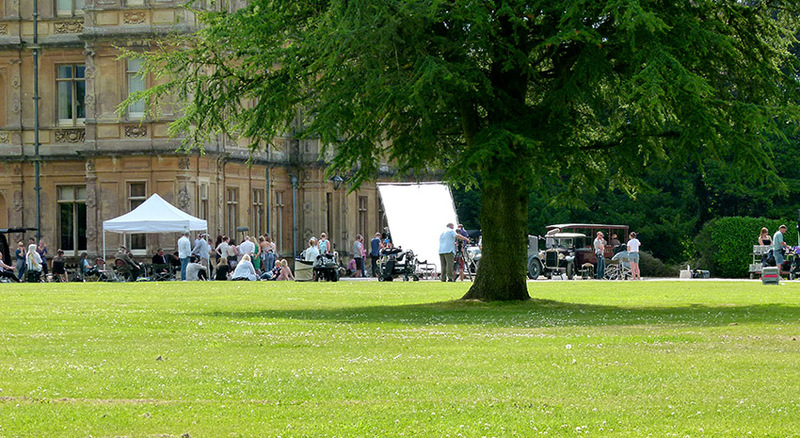 ‘Love reading your accounts of how the events at Highclere come to be and fun to see all the photos you blog too. Such a wonderful library, books and reading are my loves, (perhaps second only to art and painting) and your library with both valuable volumes and paintings is my cherished place from my visit at Highclere Castle. Oh, wicked Wickham! 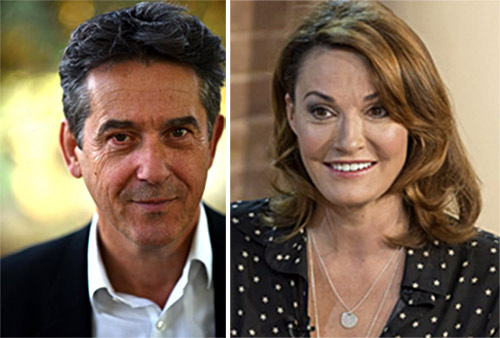 Jane Austen would be so pleased that Adrian Lukis will presenting at the Script-to-Screen event, wish I could be there as he is one of my favorite British actors. I spotted him immediately in the Downton Abbey episode when he had to sell off his estate, a brief scene, but I reflected on the fact that perhaps he was an heir of the Wickham estate, getting their fair due? Well, may the Script to Screen days be lovely sunny times at Highclere and best of success for you. Adrian is here on the Saturday – rather fun! I would be in heaven in that library of yours. As a child I was deprived of so many things, one of those being books to read. I would read anything and everything I could get my hands on and still do. It amazes me all the wonderful people you get to meet, how lovely! Continue to enjoy your nice, warm soaks in that luxurious tub and thank you for all the inspiration you share with us.. Thank you! It is lucky I just sat down at a small table, picking it by chance, and then met a lovely lady fell to talking and asked..Shrabani.. I continue to be mesmerized by the beauty of your home and grounds. I too love a bath over a shower – that stillness and warmth – moments of mystery – which are sometimes interrupted by my listening to audio books while I indulge in this pleasure! Thank you for sharing your lovely home with us. Being that I am from the USA I do not get to visit often to see its beauty personally. I was however, there in 2014 and loved each minute I spent wandering the halls and sipping the tea. Please do not struggle of wich room you should choose as a favourite. You do not have to. You can love everyone just a little bit and that is good enough. Personality I m u s t love my 1 bedroom. I have only got 1. My 1 sittingroom. My 1 sweet kitchen. Otherwise my life at home would be rather sad. In my bedroom I enjoy sleeping in my self-restored antique-bed. In my sitting-room overlooking the roofs of the old Town I love my old sofa, my english armchair, enjoying one of my hundreds of books: Hardy, Dickens, Trollope. I feel lucky in my kitchen, cooking Indian, Asian, vegetarian, bread and long-breakfasts. Maybe you have a secret, rather ordinary favourite-room in your “cottage” on the estate. I was reading this particular blog and thought “Oh is she going to have a picture of herself in the bath? !” I grew up with a huge claw foot porcelain tub in our bathroom. My Mom used to throw three of us in there at a time to get our baths done. She still lives in the home we grew up in and being 90 years young – she still loves her tub – but now there is a little chair in it. She climbs in (assisted) and still uses it. What a wonderful idea you had in the tub – so cool to meet all those wonderful people! Hello Lady C — enjoy watching all Brit shows — in fact Sunday evening after dinner is PBS time and all shows Brit! Your post made me smile as my best ideas come to me when I am in the shower! As an Anglophile and blogger, I can’t wait to visit Highclere! Thank you for sharing posts on so many interesting topics. It is a very fun read. Oh how lovely! Your bathtubs are all beautiful and inspire a long soak. A hot bath works wonders for a tired body and mind. I suppose one of the joys of living at Highclere is that you have so many choices. What an inspiring place to come up with bright ideas! Like you, I come up with such interesting ideas when I am soaking and dreaming in the tub. Seeing the photo of Highclere’s library is a lovely reminder that books still matter in the digital era. Great ideas matter. Touching the pages in a real book is so different from reading online. I could spend hours there, listening to music and reading your books. And the shows! I grew up watching Brit dramas and they always resonate with me – the humor, timeless stories and settings. Of course it’s also wonderful to see a beautifully produced show or movie too. I so wish I could be there on May 23rd! Oh to be in England to learn about the script going to the screen! What a wonderful ‘cast’ of speakers you have arranged for the “Script to Screen” week at Highclere. My family and I have been looking forward to attending since the day we booked earlier in the year. Your wonderful blog has further “whet our appetite”. Not long now. And how splendid to read that this was all inspired by an Archimedes like moment you had in a bath. “Eureka”, well done. Are these Saturday Speakers a special ticketed event? Is it part of the tour? How wonderful it would be to attend! I’m still hoping and praying we can attend the September Event for the B17 remembrance. That is dear to my heart since my Husband is a Vietnam Veteran. I really enjoyed the photos you posted. What lovely big bath tubs you are blessed with at Highclere! I can just imagine how glorious it is to soak in the warm water and be able to stretch out and relax! Please keep up the good work! I look forward to reading your blog from week to week. Thank you for offering this bright spot to begin the week. A soothing sumptuous bath not only draws out the worst in us but also the best in us. Ah yes, a good soak surrounded by warm, lavender scented water, a lavender and cream face mask (to die for! ), with copious amounts of peace and quiet. No books…..eek, I’d be afraid I would nod off and drop them! Oh yes, the window shall be open a bit to let in the lovely bird song…..
My husband and I are currently watching DA (me for the 4th time). We are both puzzled & curious about how the staff knows when to be outside the front main door to greet arriving guests. Especially before the phone was installed. The staff is perfectly aligned as the car rolls up! How did they know the EXACT time to expect the visitors? The magic of TV today but in the past there was a hall boy who would keep an eye out. Many guests came by train which was therefore a known time and staff could be marshalled at the right time. Today we have radios so our carparkers/security radio up and Luis and team are then on hand. Naturally it does go wrong too …. I so enjoy your blog and read it from South Louisiana in the USA – Baton Rouge actually. I love watching Downton as I continue to rewatch it on Amazon Prime. I have always wondered about the women’s clothing storage. I see no closets nor armoires in which to store their beautiful clothes so where are they? As they don’t have a dressing room as the men, is there a room in which all their daily clothing is kept? I would so love to know! Any photos you could share would be wonderful. Thank you in advance. One day I would love to visit your beautiful home. There are large armoires in the bedrooms here but I think that many of the shots of Lady Edith’s or Lady Grantham’s room were towards a bed or sitting at a dressing table, so much of each room was not really in shot! I always wondered how you came up with such wonderful ideas. It seems you spend lots of time soaking in the tub!!! (who knew?? laughing) From Script to Screen sounds heavenly. The speakers all have such a fine pedigree in film in the United Kingdom. I especially love Poldark, so I would love to hear behind the scenes stories. Lady Carnarvon ,I think you already have a knowledge of how films are made because Highclere has been the main character in Downton Abbey and has been featured in other films. I think your guests will learn so much and Script to Screen should be a joy for all who attend. I’m sure as a fan of Poldark you will be delighted to get an insiders look at the series. Who knew bubbles were the secret to your creative projects? I’m glad you “came clean” by admitting the source of your inspiration!!! I wish I was closer!!! So much!! 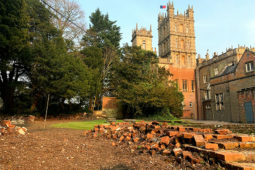 There is a lot going on at Highclere and always interesting. Thanks for sharing and making me dream I will go back one day… soon! Nothing like a leisurely bath time. Filled to the top with bubbles, my bath has been my refuge since I was a young girl. In fact when I was in high school I studied my lessons in the bath tub, so I certainly understand your time of contemplation. Yes! Once again, your writing is a gift — to you and to us all! And even when not using a full bath, the hot water on my shoulders and back make for relaxing thinking time in the shower. Again an interesting story and wonderfull photos and two of them found my special interest! 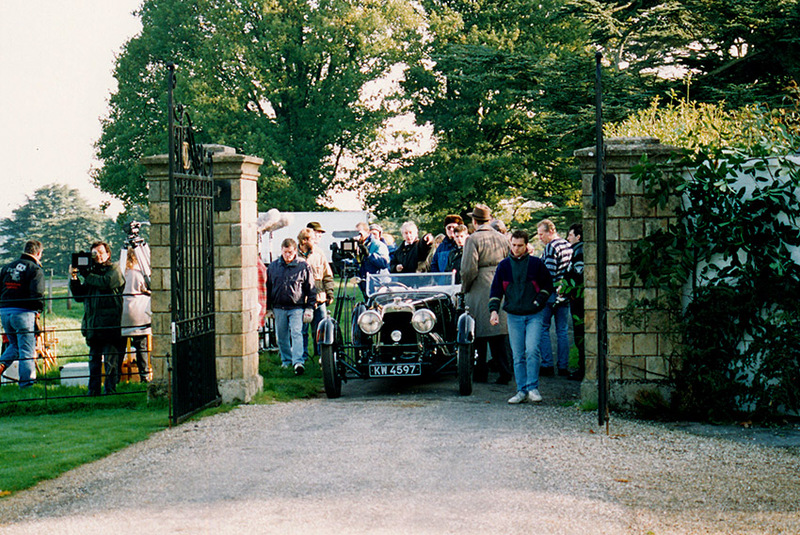 When I think of the precision and attention to detail during the shooting of Downton Abbey, i wonder how an Aston Martin built in 1927 can be seen on the doorstep of Highclere Castle – the series ended on 01.01.1926! Bath or shower or both, I love each for different reasons. The addition of fragrant bath or shower gel or bath salts makes it luxurious. It is great to luxuriate in a hot bath but I am transported to far away places much like reading a good book does, by fragrance –and the addition of fragrant candle/s help to put it over the top. A friend of mine likes to tie various fresh herbs in a bit of muslin which she then attaches to the tap of her bath and let the hot water loosen up the oil which then becomes part of the bath water. She says, it is heavenly and I tend to agree. It was a delight to meet you briefly on Sunday – it made my trip to Highclere even more special. My husband was a little mortified that I would ask for a photo with you but you were so gracious and charming and I loved listening to you talk about Mary Berry coming to Highclere, training to be an accountant among other things. Immediately after meeting you we had booked afternoon tea upstairs in your Coach House and were greeted and served by Luis (give that man a medal for hard work). He too was utterly charming but like you so friendly and warm. Delicious afternoon tea by the way. Our trip back to my homeland is now over but we have brought wonderful memories back to Colorado of our time in the counties of southern England. Thank you for being a part of that. I have read, and reread your latest Blog , and it is all so interesting. You speak of relaxing in the tub and yet, it sounds as if you live such a hectic life at times I’m wondering when you can catch the time to ‘sit, soak, and ponder’! But knowing you, you’ll make the time for a brief respite in which to gather your thoughts for another Blog, or another wonderful gathering. You have such a gift. I always have to be reminded to take time for a ‘breath’, as it were, before running full steam ahead to the next task at hand. Thank you for enlightening and brightening my morning with your writing. Sharing, as you do, always brings me joy, and transports me to a different place and time. On closets: when I was in Europe a while ago, I too noticed a lack of closets. The guide explained back when many of the houses were built, a closet you could walk into was considered for tax purposes to be a room. So they didn’t build closets but rather untaxed armoires. In England too? In Amsterdam you were taxed by the width of your house; so staircases were very narrow. Thus furniture for the upper stories had to be winched up, hense the pulley near the roof on the outside of most houses. Where there’s a will, there’s a way. Those books are mine, now, and I’ve added one with my name: the poet Shelley! I love your blog and all the stories you share with us. Are your books translated in french? Because I live in Québec, Canada and I will love to read the story and historical work that you had written about your castle. I am a children book writer my self, and I published as many as 20 books, now! And I have a serie of 5 books, about horses who is special for me and my family, because it is inspire from my daughter’s passion for horses and the pursuite of her dream to become a dressage cavalière. 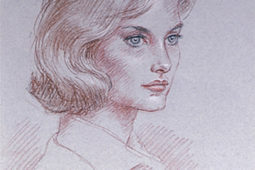 I invite you to see my work on my website and I hope I can read your books in french soon! 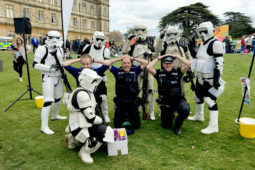 Have a nice day at Highclere! At the end of each day I take my “Goddess Bath” with Lavender Bath Products including candles, bubble bath, etc. To me there is nothing more relaxing and I cannot sleep well without this regular ritual I give to myself each evening. I suppose I learned to enjoyed bathing in the claw footed bathtub at my grandmother’s victorian house.